As you know, my oldest brother’s name is Scott. What you might not now is that his partner, Sally, has Dickinson as her last name. Last summer, back before you and your mom arrived in Seattle, Melinda and I spent time in the surplus store at the University of Washington. There, they have all sorts of things the university is discarding. They put these things up for sale, first to nonprofit organizations (like PSCS) and then to the general public. You might recall that we got Théo a UW jersey at this time, and one for you, too, if I remember correctly. Anyway, Melinda spent a lot of time, more than I wanted to dedicate, to sorting through the names pulled from the backs of various of UW sports jerseys. Among the tape dispensers and discarded pieces of college furniture were dozens and dozens of names. And she painstakingly sorted through them and found several that matched people we know, among them being people named Scott (like my brother). Another was Dickinson, which just so happens to be Sally’s last name. 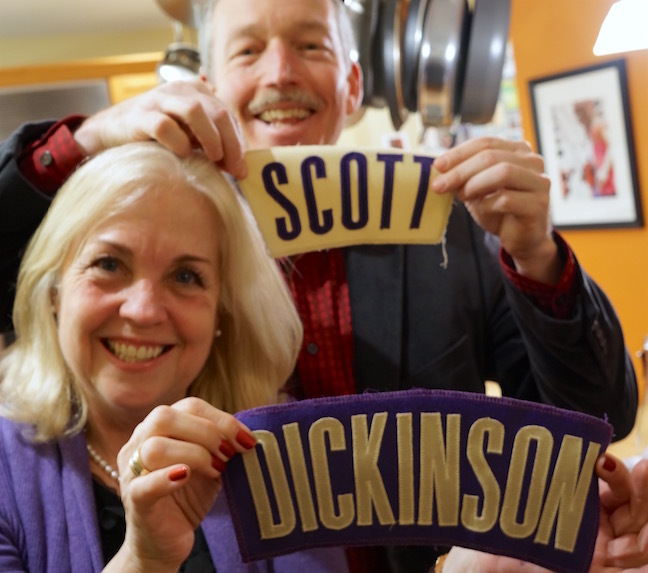 So yesterday, packed in their lovely Christmas gift that I selected, Melinda enclosed these fabric name plates, something she paid all of 10 cents each to buy. Scott and Sally were so pleased that I think they preferred these to the designer olive oil and vinegar bottles I selected to help ordain their soon-to-be-remodeled kitchen. It just goes to show you, the cost of the gift is not what matters. Happy holidays, Celeste. We miss you here. PS – Chloe keeps eating your buttercups… What should I do?